The HGTV Stearns & Foster Ultimate Bedroom Sweepstakes is open only to legal residents of the 50 United States and Washington D.C. who are 21 years of age or older. 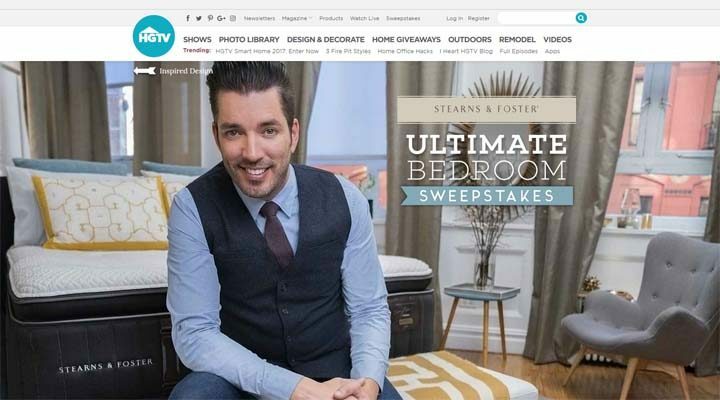 The HGTV Stearns & Foster Ultimate Bedroom Sweepstakes ends at 5:00 p.m. ET on July 13. You may enter the Promotion by visiting the HGTV at hgtv.com/stearnsandfosterbedroomsweeps, voting for a bedroom design from among the two (2) options displayed on-screen (choice of bedroom design will not affect your ability to enter or your odds of winning) and completing and submitting the online entry form with all required information. Limit of one (1) entry per eligible person, per day. The three (3) Grand Prize Winners will each receive the following: (i) a Stearns & Foster Special Edition Reserve queen size mattress created by Jonathan Scott and Stearns & Foster craftsmen; and (ii) $1,000 cash (presented in the form of a check) for bedding and décor (or otherwise). Approximate retail value (“ARV”) of each Grand Prize: $5,999. ARV of all Grand Prizes: $17,997.